Shortly before 2 p.m., the Front Fire was spotted in the Rock Front Ranch area near Highway 166 and Sierra Madre Road about 10 miles west of New Cuyama. The fire is mostly burning within SLO County. Crews led by the Los Padres National Forest fire department are battling the blaze from the air and the ground. The blaze was 5 percent contained, as of Sunday evening. 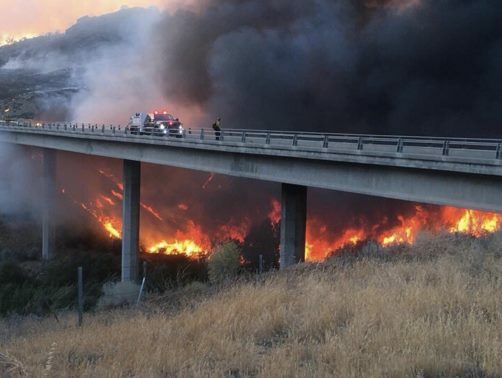 Photos show the blaze burning close to Highway 166. Officials have closed the Highway in both directions. The cause of the fire is under investigation. There have been no reports of any injuries.